Important Note: This help document is for reference only, superceded by updates to OS X that include support for 3TB drives and Fusion drive in Boot Camp Assistant. 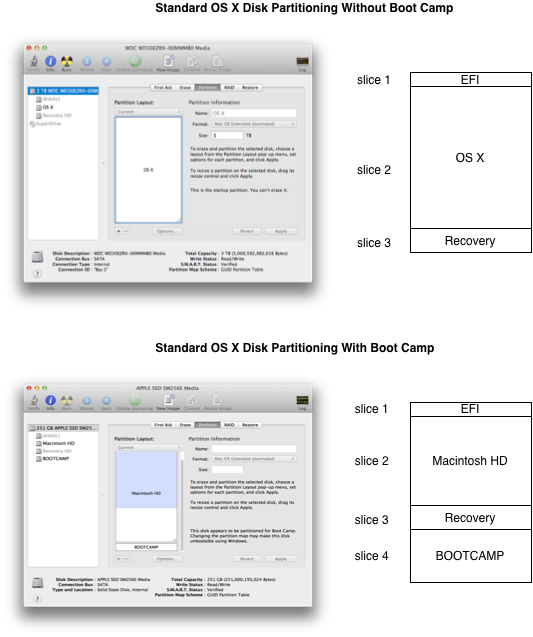 Use Boot Camp Assistant to create the Boot Camp partition. Boot Camp Assistant is not supported by Apple for hard drives larger than 2.2 TB. If you purchased a new iMac with the 3TB option (either with a Fusion drive or just a standard drive), Boot Camp Assistant will refuse to partition your hard drive into a Mac and Windows partition. However, it is still possible to create a working Boot Camp partition for Windows, provided you use the partitioning scheme as outlined in this tutorial. In order to boot Windows on a Mac, the Windows partition has to be created in a very specific place, and has a few more limitations than on a standard PC. The Boot Camp partition must be the last used partition among the first four partitions. Any partition beyond the first four partitions will not be recognized by Windows. In Lion (10.7) and Mountain Lion (10.8), there are two hidden partitions that take up the first and third slots. The first slot is taken up by the EFI partition, which is required by the standard partition scheme (GUID) that Mac OS X uses. The second slot is used by Mac OS X. The third slot is taken up by the Recovery partition. Note in the below diagram that Windows is the last in the first four partitions. Also note that Disk Utility on OS X will hide the EFI and Recovery partitions. In order for a Mac to boot Windows, a standard OS X partitioned disk (called "GPT formatted") includes a Master Boot Record partition table at the start of the drive. This partition table has only 4 available partition slots (which is the reason for the limitation above), and the total size of all four partitions is limited to 2.2 TB since the Master Boot Record partition is only able to reference data up to 2.2 TB, even if the drive is larger than that. The limitation of 2.2 TB exists on the PC as well, and modern and future PCs will use GPT formatted disks to overcome this size limitation (Windows 7 and Windows 8 provide some support for this partition scheme). Unfortunately, booting Windows with this modern method is not currently supported on the Mac, and not all versions of Windows 7 and Windows 8 support it. Since it is not possible to get around the 2.2 TB limitation with booting Windows, it is possible to organize the partitions so that Windows is the last of the first four partitons and is within the first 2.2 TBs of space on the drive. Since the Mac can see the remaining space above the 2.2 TB limit, this space can be used for addtional storage space for OS X. 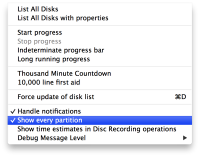 Quit Disk Utility and restart if it was running, and on restart, you should see a Debug menu. Select the "show every partition option". Once you install the 3 TB (or larger) drive in your Mac and install OS X on it, a recovery partition will be created along with the main OS X partition (see diagram below). If you use an imaging utility to install OS X on a partition, you may not see the recovery partition and you will need to manually create a partition for the thrid slot where the recovery partition would normally be located. Either way, your layout will be something like the diagram below. Note the Recovery HD is in the third position. In order to make Windows bootable on a 3 TB (or larger) drive, the Windows partition must be the last of the first four, and be contained within the first 2.2 TB of the drive. Disk Utility makes this easy to do. Shrink the existing Macintosh HD partition, and create a DOS partition so that if you add up the first four partition, they will be less than 2.2 TB total. The EFI partition and recovery partition are small (together they are less than 1 GB). Do not partition right up to the 2.2 TB limit, but leave some space. 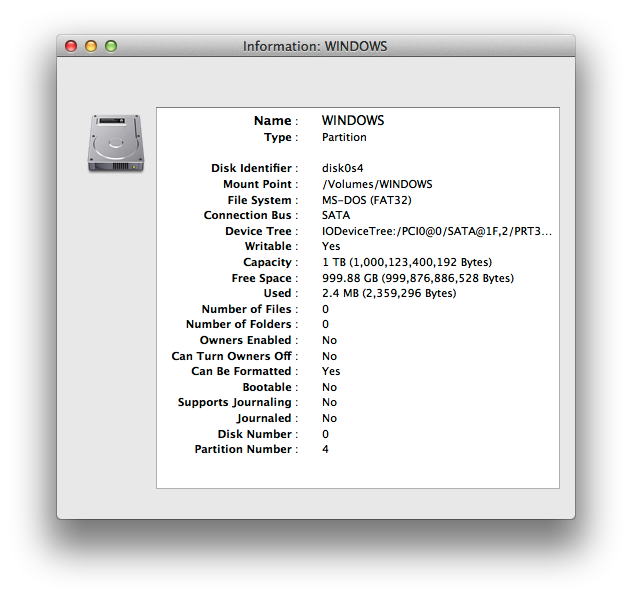 A good rule of thumb is that the Mac and Windows partitions added together should be less than 2 TB total. 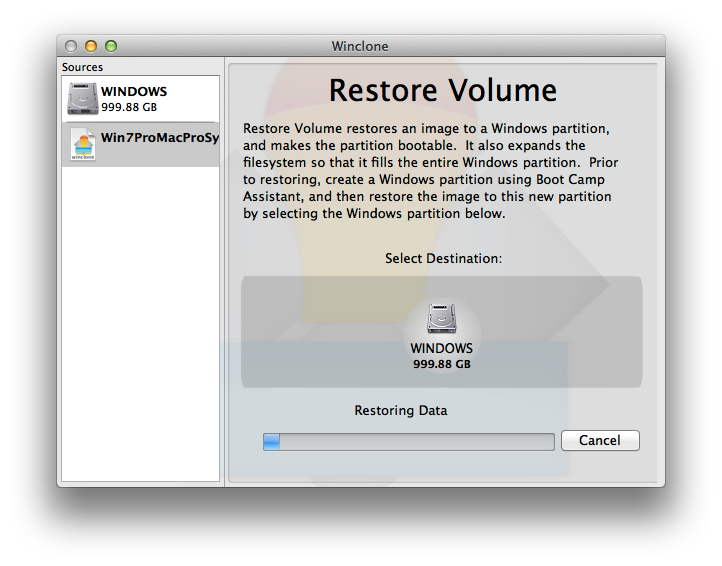 Finally, create a Mac partition that uses the remaining space following the Windows partition. 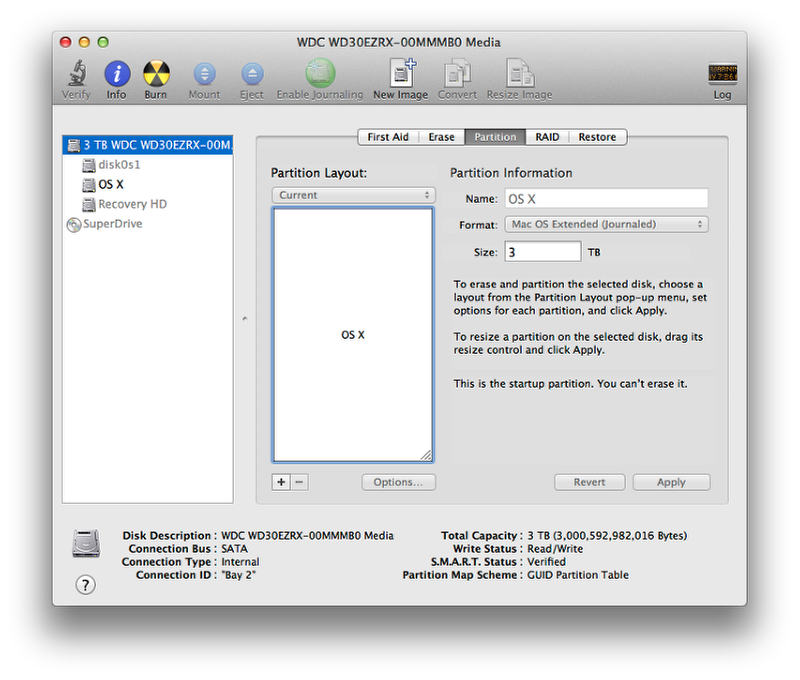 Note that this partition will not be accessbile by Windows, but OS X will be able to see and use this space. See the screen shot below for an example layout. To verify that Windows is in the fourth position, you can select the Windows partition and click the Info button. The Disk Identifier should be disk0s4. You can now boot up and install Windows on this fourth partition either by installing via CD or the USB drive that Boot Camp Assistant creates, or by restoring the image via Winclone. Please note that restoring a Winclone image to a new hard drive may require first removing device drivers using Sysprep (in this instance we are concerned with the hard drive device driver, but Sysprep will remove all device drivers on the system. Please refer to the Migrating A Boot Camp Partition with Winclone tutorial for further details. Once Windows has been installed, it will be able to see the other partitions, but will not be able to use them. Since Windows is installed on the last of the first 4 partition, and is completely before the 2.2 TB, Windows will boot fine from that partition. 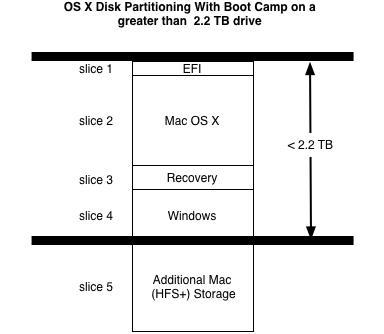 In the example below, the OS X boot partition (HFS+) is 931.32 GB and the Boot Camp partition (NTFS) is 931.44 TB, which shows a possible configuration where the two operating systems are divided into equally-spaced partitions. What may cause confusion is that Disk Management in Windows sees two containers of unallocated space to the right of Boot Camp, a 184.44 GB space and a 746.52 GB space. These spaces are actually one Mac partition 930.96 GB in size. 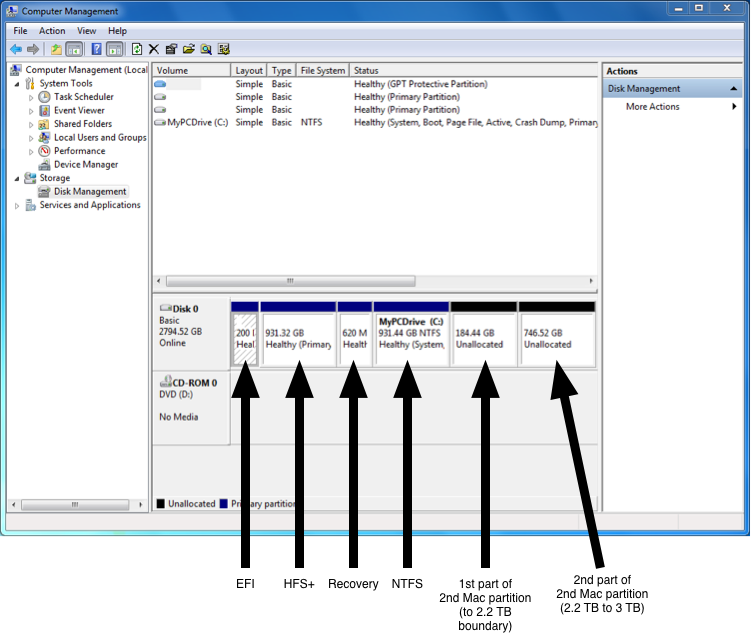 Windows sees the space separated at the point where the 2.2 TB boundary is reached. In practical terms, this space above the 2.2 TB boundary is usable as additional Mac-formatted storage space since Windows does not have access to this space, even if formatted DOS or NTFS. As the cost of large storage drives drops, multi-terabyte drives will become the standard for desktop and laptop computers. At some point the ability to run Boot Camp beyond the 2.2TB limit may become a reality. For now this workaround will help make the most of these drives on dual-boot Macs. Article published: April 21, 2017 03:08 . Article last updated: April 21, 2017 03:08 .